Throughout the art history of Greenland, catechists* around the country have been often related to, or were engaged in, art-making. Otto Sandgreen (1914-2014) was a catechist, teacher and priest; during his life he also wrote as many as 44 books and painted. 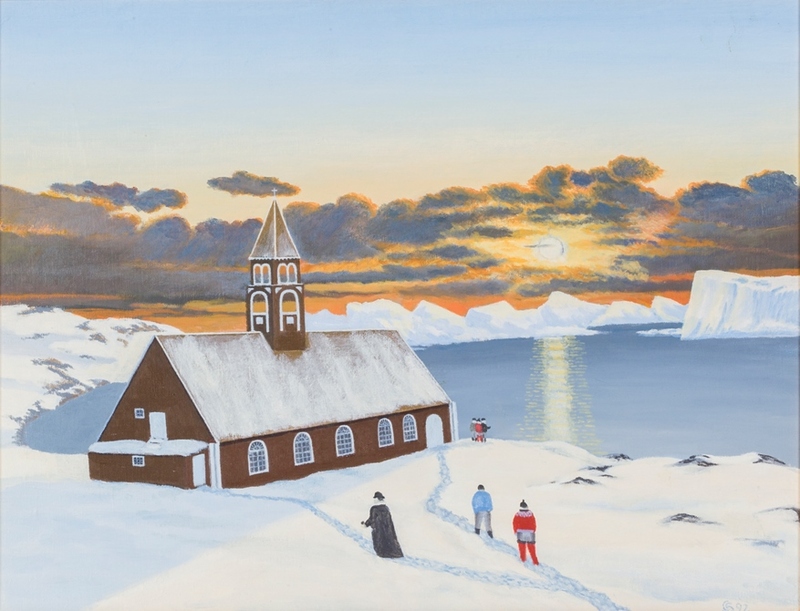 A painting of the Church of Zion in Ilulissat, realized by Otto Sandgreen in 1992, is exhibited in Nuuk Art Museum. The church occupies the left half of the painting – somewhat angular and clumsy in the perspective. Through its tower we can glimpse the sky beyond. In the background are the ice fjord, a horizon of clouds with the sun shining from behind and clear sky above. On the centreline of the painting, a priest walks on a path already trodden in the snow, towards his own entrance to the church. With his black Geneva gown he is the largest character in the painting, thus becoming the eye catcher. On another trodden path two people wearing the national costume walk up to the congregation’s entrance. A small group of three stands to the right of that entrance and one of them points to the sunbeam reflected on the water’s surface. The sunbeam can be viewed as a third pathway in the painting. The three paths come together in the right-hand side of the image. The painting can in many ways appear didactic. Otto Sandgreen wants to communicate and teach us something. Sun and light are often regarded as belonging to God. Just think, as an example, of the psalm “In the east rises the sun”, whose second stanza starts with “it comes from the fair coast, where paradise is.” The third path in the painting leads to the sun – not trodden as the other two human tracks, but shaped by and originating in sunlight. Thus maybe leading to God, maybe coming from Him. The number three – appearing in the painting as the three pathways – is likewise a fundamental number in Christianity, with the Trinity being constituted by God, Christ and the Holy Spirit. In this way the painting contains a definite Christian undertone and a message about community, the priest, church and the Kingdom of God. On the other hand, the painting can also be viewed as representing a simple everyday scene: any given Sunday morning when people are on their way to church.